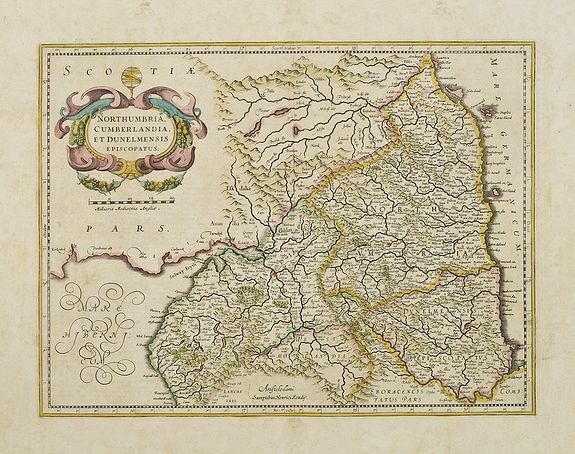 HONDIUS - Northumbria, Cumberlandia et Dunelmensis Episcopatus..
HONDIUS, H. - Northumbria, Cumberlandia et Dunelmensis Episcopatus..
Northumbria, Cumberlandia et Dunelmensis Episcopatus.. - HONDIUS, H.
Map maker : HONDIUS, H.. Size : 13.8 x 18.3 inches. / 35.0 x 46.5 cm. Description :Showing the most northern part of England, including Sunderland. Condition : Paper slightly age toned as usual. Water staining in margins.